Save up to a further $200 on your next Friendly Travel Tour! To kick off the new year, we are excited to announce our “Welcome Back Program” which applies to all customers who join our Friendly Travel organised tours in 2017 and beyond. 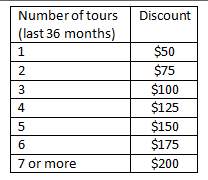 This is our way of saying thank you and rewarding customers who have been on multiple tours with Friendly Travel. Once again, we thank all of our customers for the continuing support!